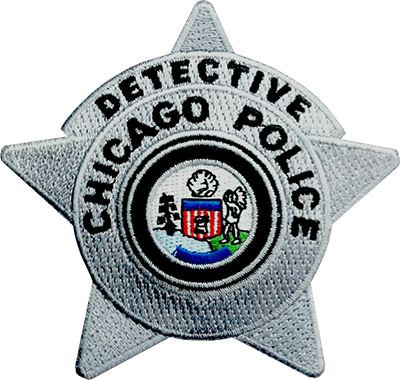 Representations and descriptions of both active and inactive uniform patches worn by Chicago Police Department members. Description: Worn by uniformed Officers of all ranks, including uniformed civilian members, the flag measures approximately 2 1/4″ in height and 3 1/2″ in width. The patch is to be worn on the right upper sleeve. Material: Simpsons Parity Poplin in White 65% dacron / 35% cotton, Klopman’s Concept in White 65% dacron / 35% cotton or Reeves Parity Poplin in White 65% dacron / 35% cotton. Embroidered with 150/2 rayon, vat dye, colorast, red, copen blue, white. Dimensions: The patch will be rectangular in shape and measure 3 1/2″ wide by 2 1/4″ high with a thickness of 1/16″. The upper and lower white stripes will measure 1/4″ of an inch wide. The middle white stripe will measure 3/4″ wide with four bright red stars, set side-by-side, close together. The outside stars are to be centered 1″ from the outside of the merrowed border. The inside stars are to be centered 1 1/2″ from the outside of the merrowed border. The blue stripes will measure 3/8″ wide. Finish: Professional finish and workmanship with laser cutting to exact size and shape of the approved design. Placement: The Shoulder Patch will be centered on the wearer’s right sleeve 1 1/2″ below the shoulder seam and be sewn on with thread that closely resembles the outer border of the patch. Description: Worn by a uniformed Police Aide of the Chicago Police Department. The Police Aide is a civilian employee of the Department. They assisted sworn police officers working at district desks or in administrative capacities doing clerical work. Material: Simpsons Parity Poplin in White 65% dacron / 35% cotton, Klopman’s Concept in White 65% dacron / 35% cotton or Reeves Parity Poplin in White 65% dacron / 35% cotton. Embroidered with Robinson-Anton Textile Company FD-3 Royal Blue or equal dye color for the lettering and merrowed border. Dimensions: The patch will be circular in shape and measure 2 1/4″ in diameter. Placement: The Cap Patch will be centered on the wearer cap front and be sewn on with thread that closely resembles the outer border of the patch. 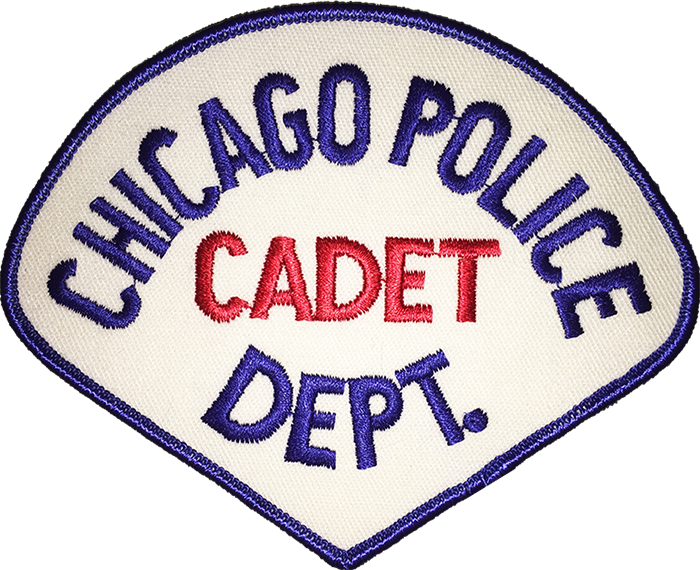 Description: Worn by a uniformed Police Cadet of the Chicago Police Department. 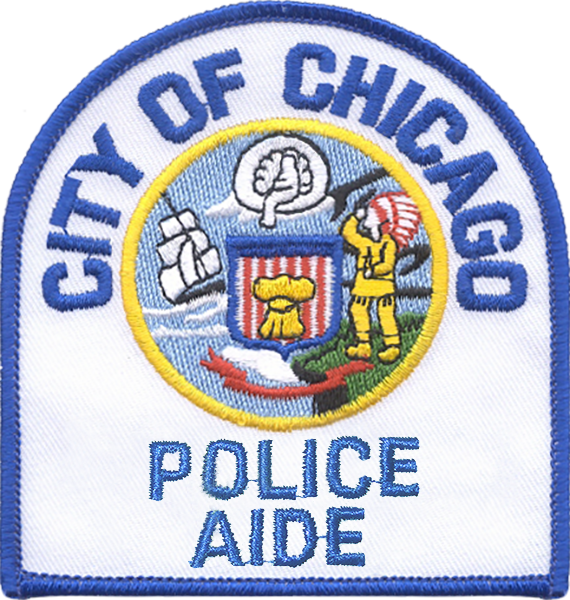 The Cadet Program allows high school graduates between the ages of 17 and 21 the opportunity to affiliate themselves with the Chicago Police Department on a part-time basis prior to reaching the eligible age for appointment as a police officer. Material: Consists of a 65% Polyester and 35% Cotton blend, permanent pressed in white. Simpsons 1202, or an approved equal. Embroidered with Robinson-Anton Textile Company FD-3 Royal Blue or equal dye color for the lettering and merrowed border. Dimensions: The patch will be teardrop in shape and measure 4 3/4″ wide by 3 3/4″ high with a thickness of 1/16″. 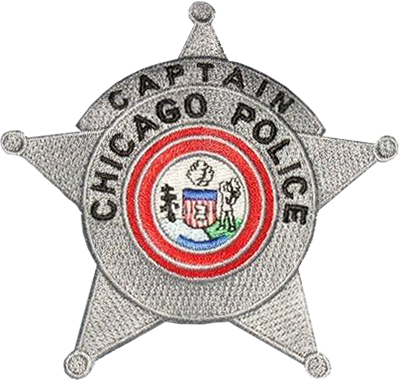 Lettering: The Shoulder Patch will have the letters of the words “CHICAGO POLICE” positioned in an upright position over the word “CADET” within the Upper portion of the patch, centered. The abbreviation “DEPT.” will be positioned in an upright position under the word “CADET,” centered. All letters are to be approximately 9/16″ in height and 1/8″ wide. A 1/8″ rolled merrowed border will be stitched on the outer edge of the patch. A 1/4″ overlap will complete the merrowed border and the loose ends of the stitching will be secured to the back side of the patch. Placement: The Shoulder Patch will be centered on the wearer’s left sleeve 3/4″ below the shoulder seam and be sewn on with thread that closely resembles the outer border of the patch. 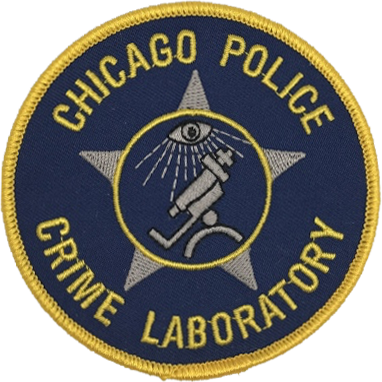 Description: Worn by uniformed personnel of the Chicago Police Department Crime Laboratory. Material: Consists of a 65% Polyester and 35% Cotton blend, permanent pressed in white. Simpsons 1202, or an approved equal. Embroidered with Robinson-Anton Textile Company Gold or equal dye color for the lettering and merrowed border. Dimensions: The patch will be circular in shape and measure 3 1/2″ in diameter. 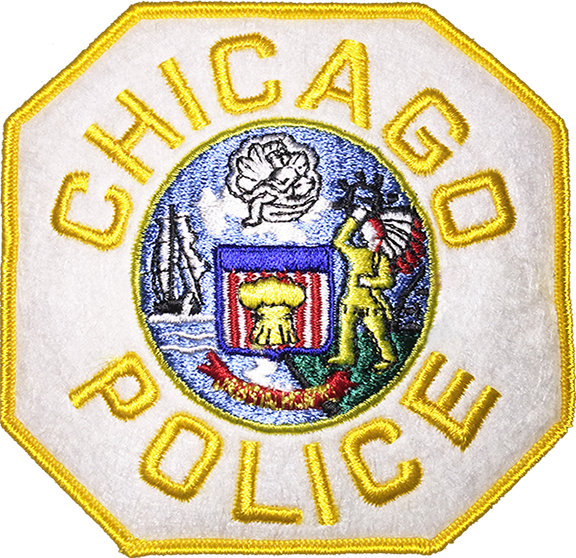 Lettering: The Shoulder Patch will have the letters of the words “CHICAGO POLICE” positioned in an upright position over the seal within the Upper portion of the patch, centered. The abbreviation “CRIME LABORATORY.” will be positioned in an upright position under the seal, centered. All letters are to be approximately 5/16″ in height and 1/8″ wide. A 1/8″ rolled merrowed border will be stitched on the outer edge of the patch. A 1/4″ overlap will complete the merrowed border and the loose ends of the stitching will be secured to the back side of the patch. Placement: The patch will be placed on the wearer’s lab coat on the left breast and be sewn on with thread that closely resembles the outer border of the patch. 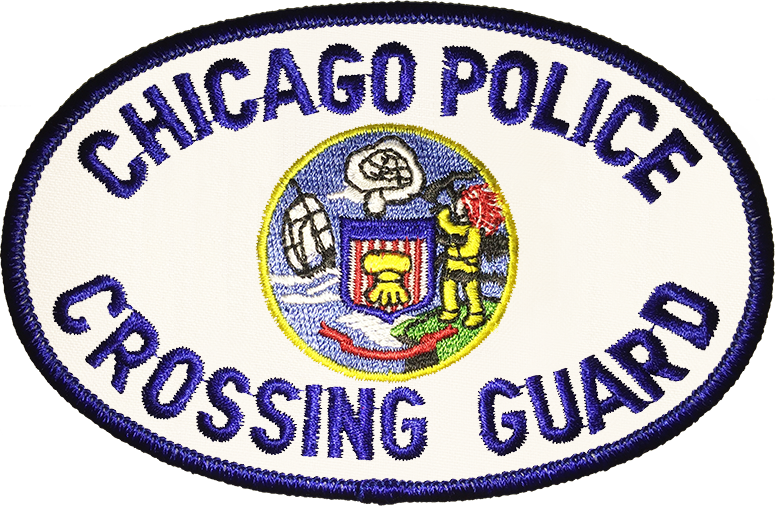 Description: Worn by a uniformed Police Crossing Guard of the Chicago Police Department. The Crossing Guard was a civilian employee. They assisted children at crossings located near schools. In July 2016, about 900 Crossing Guards were transferred from the control of the Police Department to the Office of Emergency Management and Communications. 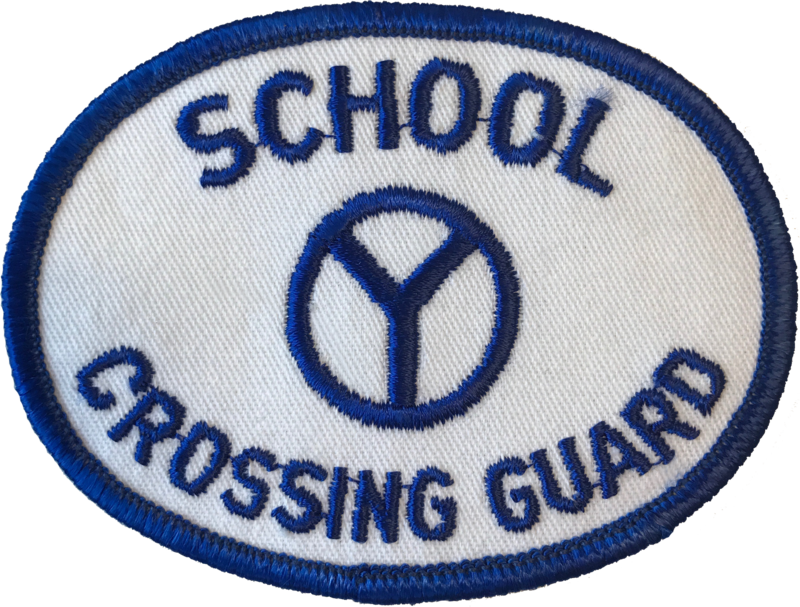 The crossing guards were issued new shoulder patches and were not issued new badges. However, under agreement existing crossing guards who had badges were authorized to continue to wear them in their new positions. Dimensions: The patch will be ovular in shape and measure 3 1/2″ wide by 2 inches high. Lettering: The Hat Patch will have the letters of the words “SCHOOL” positioned in an upright position over the municipal device within the Upper portion of the patch, centered. The words “CROSSING GUARD” will be positioned in an upright position under the municipal device, centered. All letters are to be approximately 3/8″ in height and 1/4″ wide. A 1/8″ rolled merrowed border will be stitched on the outer edge of the patch. A 1/4″ overlap will complete the merrowed border and the loose ends of the stitching will be secured to the back side of the patch. Placement: The Shoulder Patch will be centered on the wearer’s white round crown hat front and be sewn on with thread that closely resembles the outer border of the patch. Dimensions: The patch will be ovular in shape and measure 4 1/2″ wide by 3 inches high. 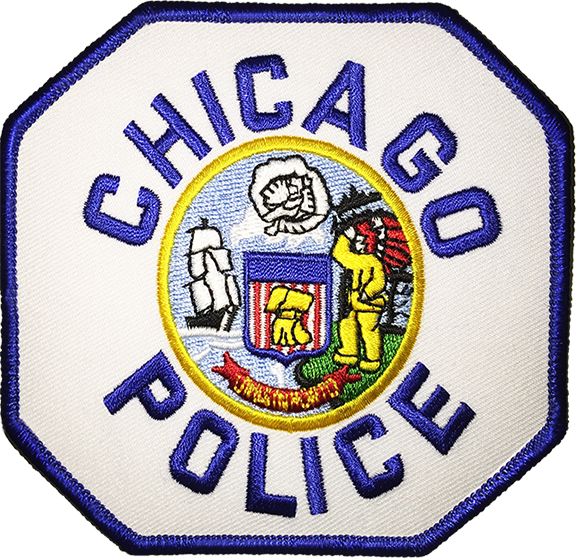 Lettering: The Shoulder Patch will have the letters of the words “CHICAGO POLICE” positioned in an upright position over the city seal within the Upper portion of the patch, centered. The words “CROSSING GUARD” will be positioned in an upright position under the city seal, centered. All letters are to be approximately 3/8″ in height and 1/4″ wide. A 1/8″ rolled merrowed border will be stitched on the outer edge of the patch. A 1/4″ overlap will complete the merrowed border and the loose ends of the stitching will be secured to the back side of the patch. 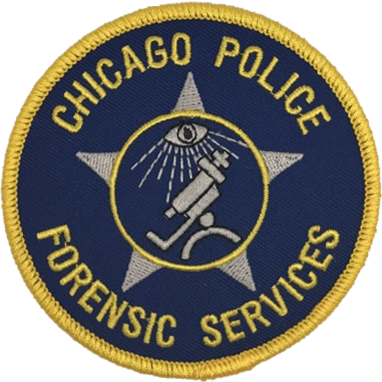 Description: Worn by uniformed personnel of the Chicago Police Department Forensic Services Division. 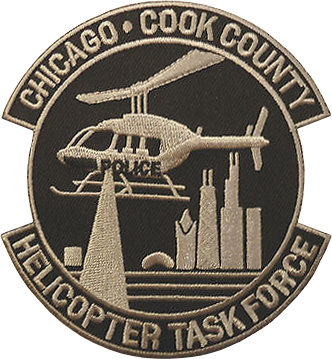 Description: Worn by a uniformed members of the Helicopter Operations Unit. The patch is only authorized to be worn when unit members are uniformed in the navy-blue flight suit. Material: Fully embroidered, the backing material shall be 7-8 ounces / yard, 65% polyester / 35% cotton twill. The thread will be colorfast super-strength rayon yarn vat-dyed in corresponding colors of the appropriate patch in Pantone® colors or equal and applicable standards. Thread colors are Black #5596C and Grey #650C. Dimensions: The patch will be of the “squadron” style and measure 3 3/4″ wide, measured from outer edges of the attached banners, by 4″ high. The diameter of the center circle will be 3 1/4″. Lettering: The font will be in block print and measure 1/4″ in height and 1/8 of an inch wide. A 1/8″ rolled merrowed border will be stitched on the outer edge of the patch. A 1/4″ overlap will complete the merrowed border and the loose ends of the stitching will be secured to the back side of the patch. 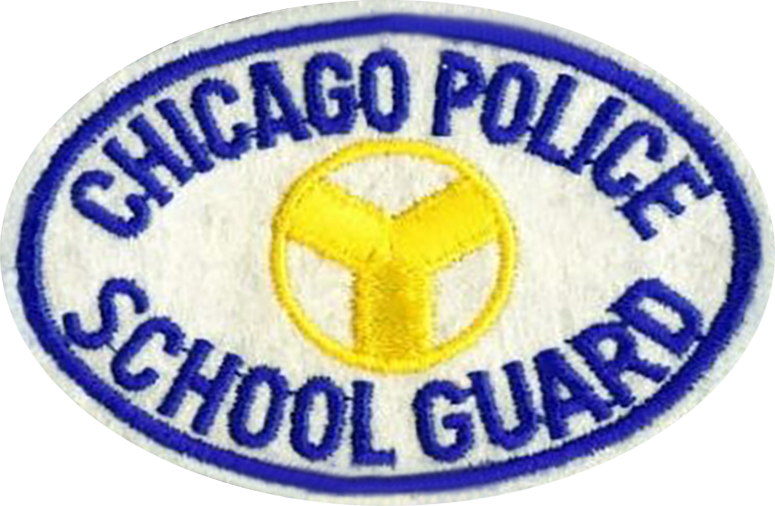 Description: Worn by a uniformed School Guard of the Chicago Police Department. The School Guard was a civilian employee. They assisted children at crossings located near schools. This position was replaced by the Crossing Guard position. 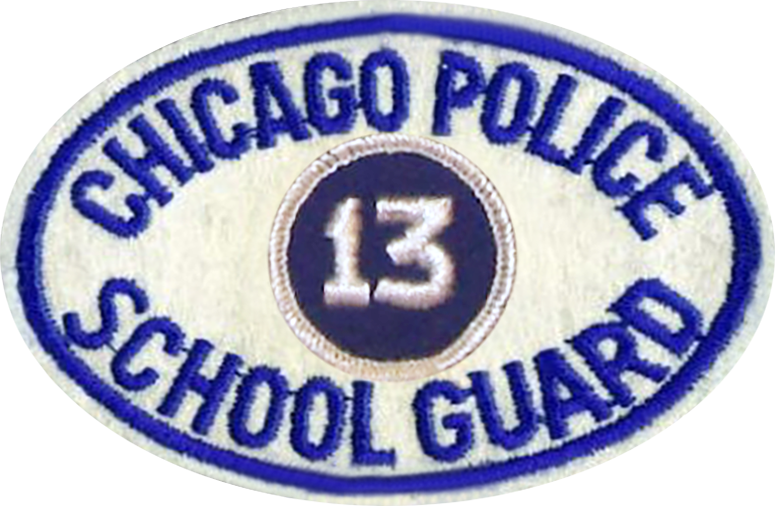 On December 6, 1974, the School Guard patch was modified and required guards to have the District / Unit Insert Patch sewn over the Municipal Device. Material: Consists of felt in white. Embroidered with Robinson-Anton Textile Company FD-3 Royal Blue or equal dye color for the lettering and merrowed border. Dimensions: The patch will be ovular in shape and measure 3 3/4″ wide by 3″ high. 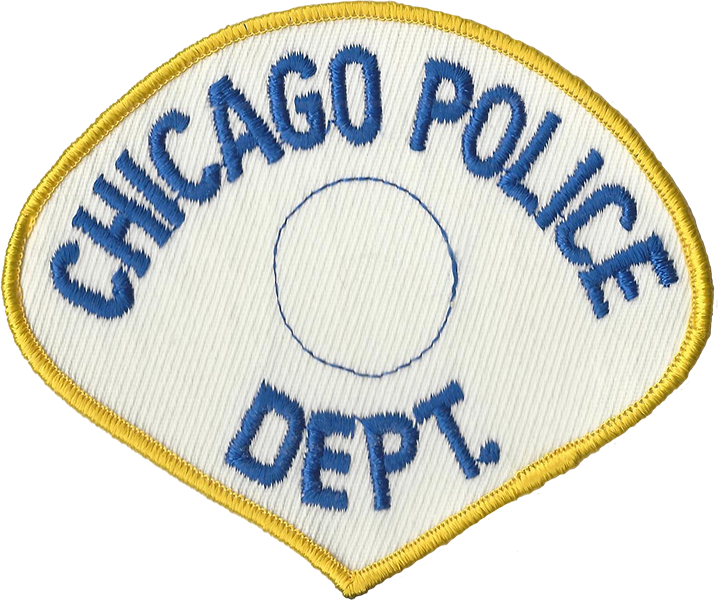 Lettering: The Shoulder Patch will have the letters of the words “CHICAGO POLICE” positioned in an upright position over the Municipal Device within the Upper portion of the patch, centered. The words “SCHOOL GUARD” will be positioned in an upright position under the Municipal Device, centered. All letters are to be approximately 3/8″ in height and 1/4″ wide. A 1/8″ rolled merrowed border will be stitched 1/8″ from the outer edge of the patch. 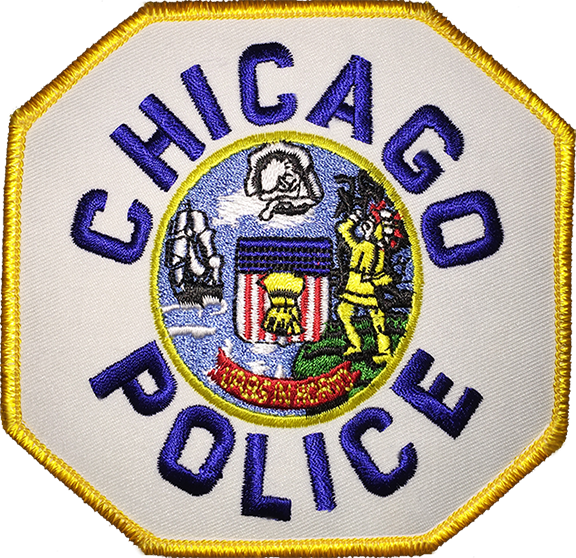 Description: Worn by sworn uniformed members of the Chicago Police Department. 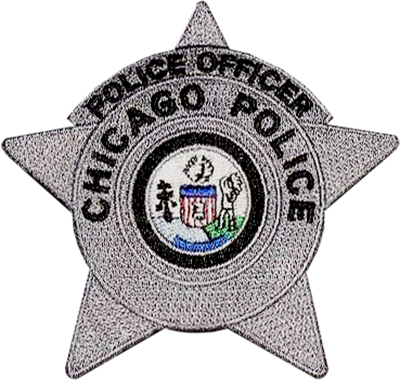 The Police Officer patch was worn by: Patrolmen, Patrolwomen and Detectives. Civilian employees were also authorized to wear this patch when affixed to the Laboratory, Smock and Specialized Shop Coats. 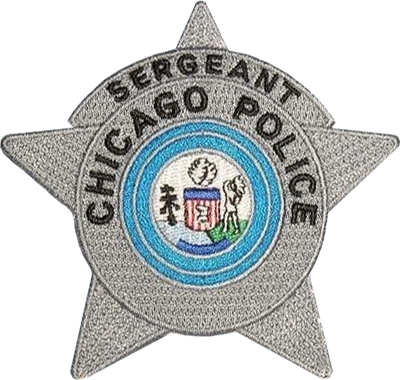 The Supervisor patch was worn by Sergeants, Lieutenants and Captains. 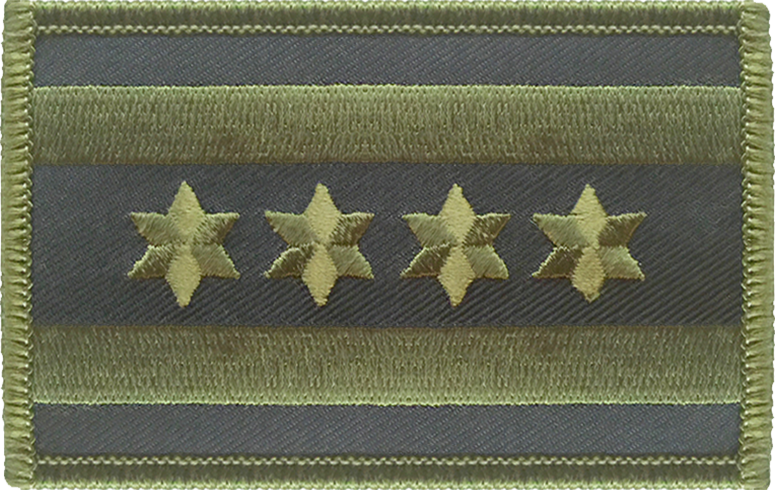 The Command Staff patch was worn by members in the exempt career service from the rank of Commander through Superintendent. Material: Shirt / Outer Garment Patch – 65% polyester / 35% cotton, permanent press, white. Simpsons 1202, or an approved equal. Embroidered with Robinson-Anton Textile Company FD-3 Royal Blue or equal dye color for the lettering and merrowed border. Blouse / Reefer Patch – 50% wool / 50% rayon, 12 oz., white. Commonwealth felt Company #650, or an approved equal. Embroidered with Robinson-Anton Textile Company FD-3 Royal Blue or equal dye color for the lettering and merrowed border. Viscose rayon (Schiffli), 150 denier, two-ply, special twist, continuous filament, prime quality thread (embroidery). All colors must be vat dyed to withstand laundering and dry cleaning. There shall be no running, bleeding or fading of color. Embroidered with Robinson-Anton Textile Company FD-3 Royal Blue or equal dye color for the lettering and merrowed border. The underside (back) of the shoulder patch is to be laminated to ensure stiffness. laminated polyester/cotton shoulder patches must have at least one layer of Crinolene (Olc), or equal. Heat seal laminations are not acceptable. Wool/rayon patches are to have one layer of Crinolene (5S%), or equal, starch / sized or laminated. There shall be no puckering or bunching of the exposed side of the patch. 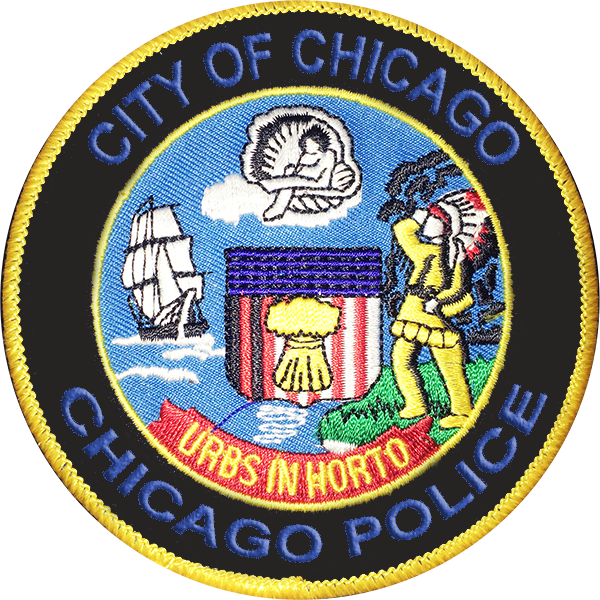 Lettering: The Shoulder Patch will have the letters of the words “CHICAGO POLICE” positioned in an upright position over the city seal within the Upper portion of the patch, centered. The word “DEPARTMENT” will be positioned in an upright position under the city seal, centered. All letters are to be approximately 9/16″ in height and 1/8″ wide. A 1/8″ rolled merrowed border will be stitched on the outer edge of the patch. A 1/4″ overlap will complete the merrowed border and the loose ends of the stitching will be secured to the back side of the patch. 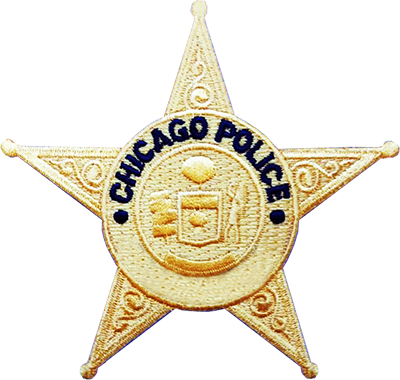 Description: Worn by sworn uniformed members of the Chicago Police Department. The Police Officer patch is worn by: Police Officers, Patrol Specialists / Field Training Officers and Detectives. Civilian employees are also authorized to wear this patch when affixed to the Laboratory, Smock and Specialized Shop Coats. 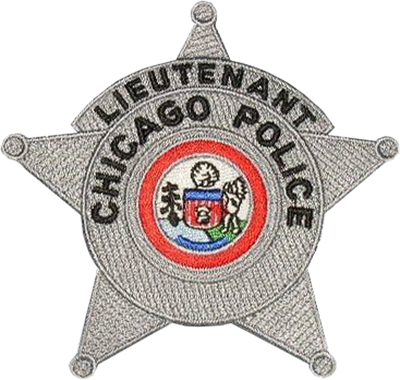 The Supervisor patch is worn by Sergeants, Lieutenants and Captains. 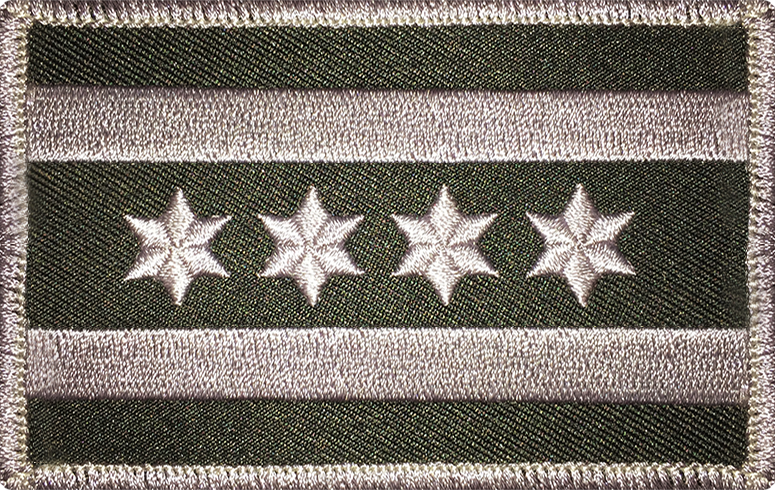 The Command Staff patch is worn by members in the exempt career service from the rank of Commander through Superintendent. The Subdued patch is worn by members of all ranks in Special Units, District Tactical & Gang Teams when they are uniformed in their BDU class uniform. When this design was introduced, a wear out period was authorized and this patch was required to be sewn on to all authorized garments by October 31, 1982. Blouse / Reefer Patch – 50% wool / 50% rayon, 12 oz., white. Commonwealth felt Company #650, or an approved equal. Viscose rayon (Schiffli), 150 denier, two-ply, special twist, continuous filament, prime quality thread (embroidery). All colors must be vat dyed to withstand laundering and dry cleaning. There shall be no running, bleeding or fading of color. Dimensions: The patch will be octagonal in shape and measure 4 inches wide by 4 3/8″ high with a thickness of 1/16″. Each set of vertical and horizontal planes, two each, will be 2 3/16″ in length. The end points of the vertical and horizontal line segments are to be equally divided and located at right angles upon the X and Y axis of a rectangular coordinate (Cartesian). The diagonal planes of the octagon are then developed by intersecting the end points of each adjacent vertical and horizontal line segment. 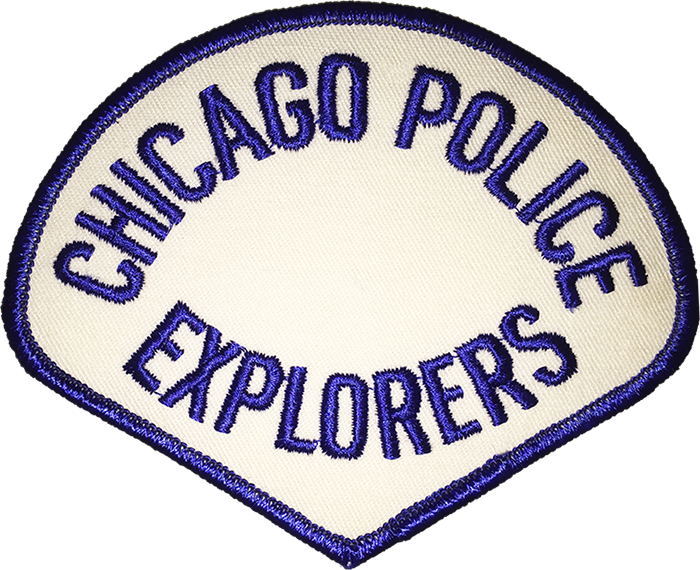 Description: Worn by a uniformed Police Explorers of the Chicago Police Department. Law Enforcement Exploring is a career-oriented program that gives young adults, 15 to 20 years old, the opportunity to explore a career in law enforcement by working with local law enforcement agencies. The program is organized by Learning for Life (LFL) a United States school and work-site based youth program that is a subsidiary of the Boy Scouts of America. 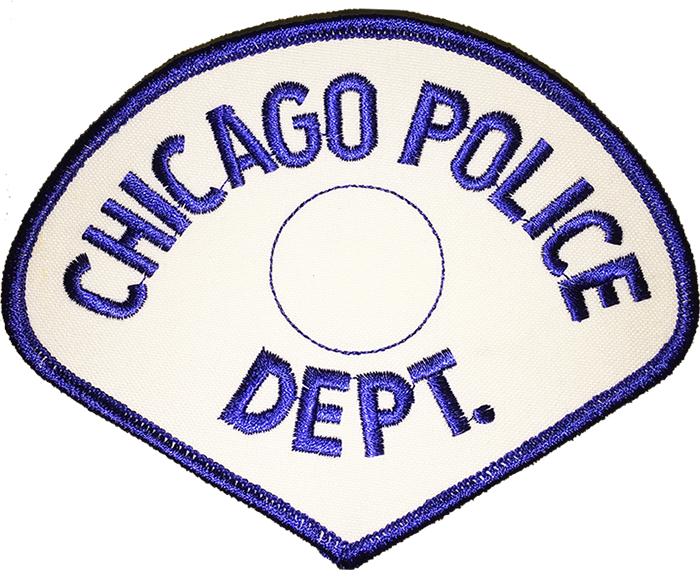 Lettering: The Shoulder Patch will have the letters of the words “CHICAGO POLICE” positioned in an upright position over the center within the Upper portion of the patch, centered. The words “EXPLORERS” will be positioned in an upright position under the center, centered. All letters are to be approximately 9/16″ in height and 1/8″ wide. A 1/8″ rolled merrowed border will be stitched on the outer edge of the patch. A 1/4″ overlap will complete the merrowed border and the loose ends of the stitching will be secured to the back side of the patch. 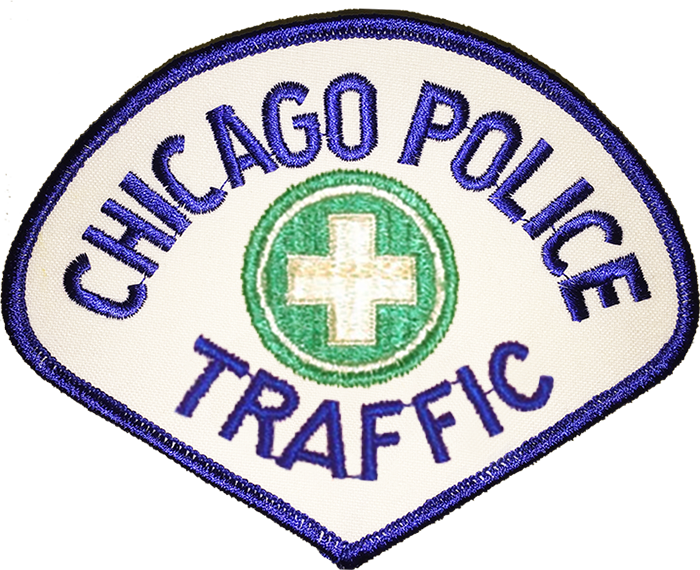 Description: Worn by sworn uniformed members of the Chicago Police Department’s Traffic Division. 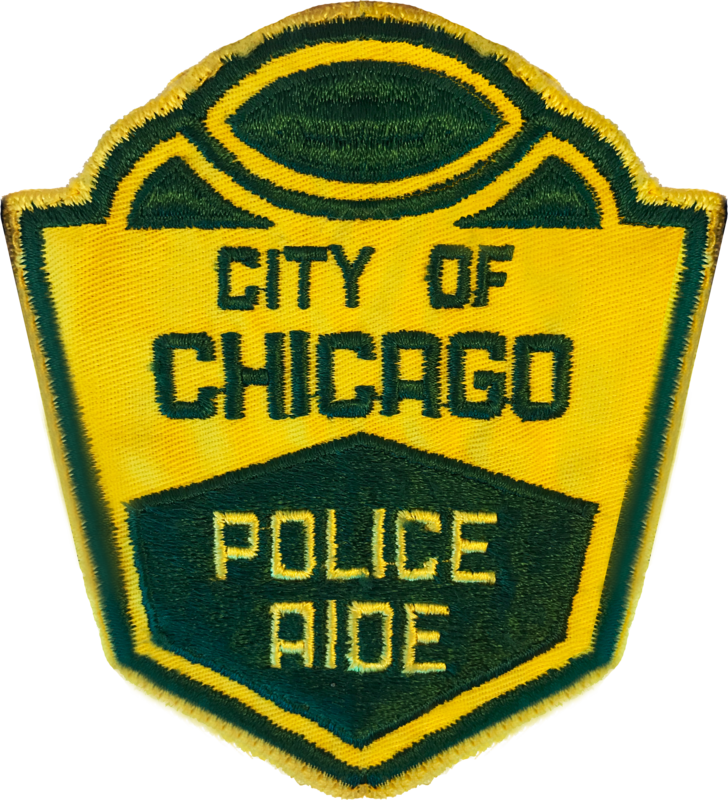 Lettering: The Shoulder Patch will have the letters of the words “CHICAGO POLICE” positioned in an upright position over green seal and cross within the Upper portion of the patch, centered. The word “TRAFFIC” will be positioned in an upright position under the green seal and cross, centered. All letters are to be approximately 9/16″ in height and 1/8″ wide. A 1/8″ rolled merrowed border will be stitched on the outer edge of the patch. A 1/4″ overlap will complete the merrowed border and the loose ends of the stitching will be secured to the back side of the patch. 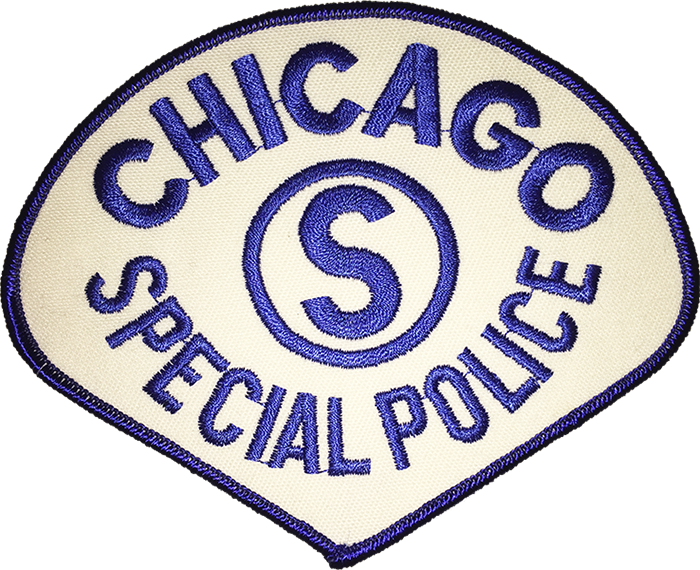 Description: Worn by uniformed members of the Chicago Special Police. 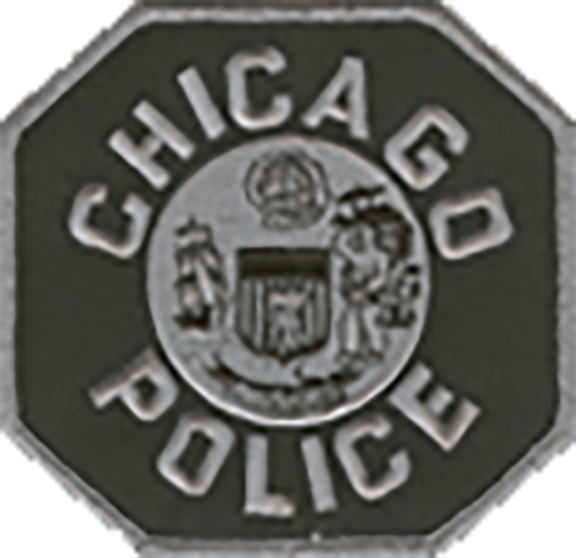 The Chicago Special Police are authorized through the Municipal Code of Chicago, Chapter 4-340. 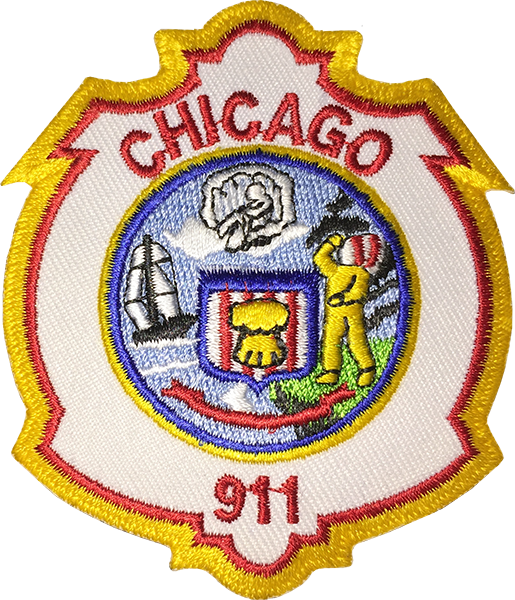 Lettering: The Shoulder Patch will have the letters of the words “CHICAGO” positioned in an upright position over the center seal within the Upper portion of the patch, centered. 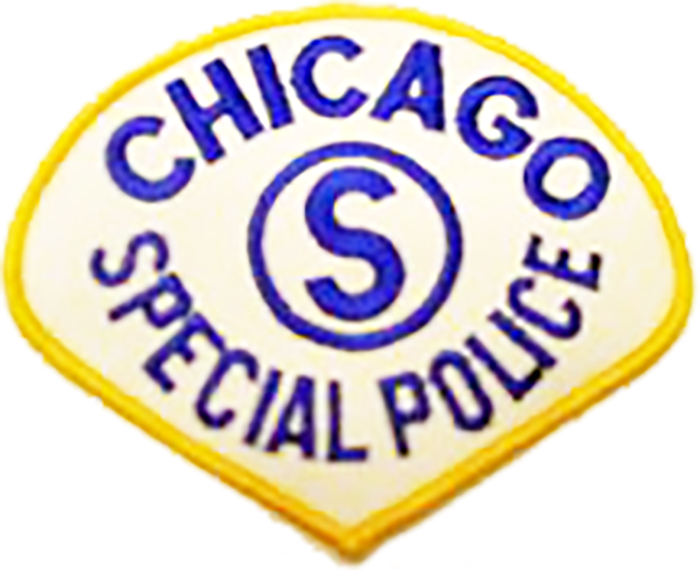 The words “SPECIAL POLICE” will be positioned in an upright position under the center seal, centered. All letters are to be approximately 9/16″ in height and 1/8″ wide, the letters in the word “CHICAGO” will be approximately 3/4″ in height and 1/4″ wide. A 1/8″ rolled merrowed border will be stitched on the outer edge of the patch. A 1/4″ overlap will complete the merrowed border and the loose ends of the stitching will be secured to the back side of the patch. Description: Worn by Civilian Operators (Dispatchers / Call Takers) and Supervisors from the Office of Emergency Management & Communications (OEMC) working on the emergency (911) side of dispatch operations. The red bordered patch is worn by members working on the Fire Department side and the blue bordered patch is worn by members working on the Police Department side. 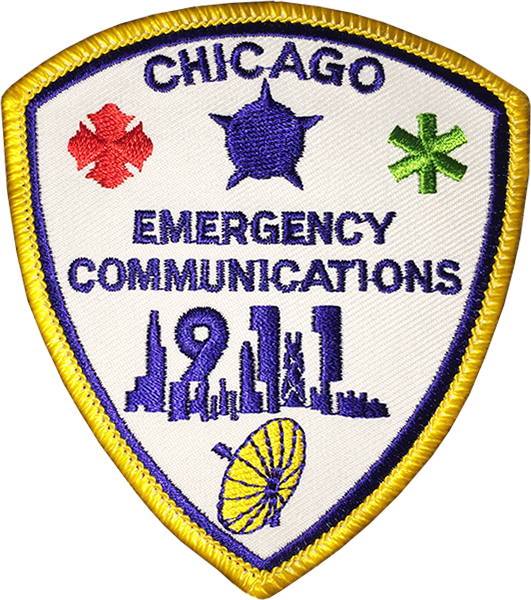 This patch was first designed and issued by the Chicago Police Department for use in the Communications Operations Section (COS) and its use was transferred over when the new Office of Emergency Communications (OEC) was created as a separate city department. OEC was later renamed the Office of Emergency Management & Communications (OEMC). Material: Consists of a 65% Polyester and 35% Cotton blend, permanent pressed in white. Simpsons 1202, or an approved equal. Dimensions: The patch will be teardrop in shape and measure 3 3/4″ wide by 4 3/4″ high with a thickness of 1/16″. The Breast Badge will be placed on the wearer’s left breast in place of the normal position of the metal police star and be sewn on with thread that closely resembles the outer border of the patch. 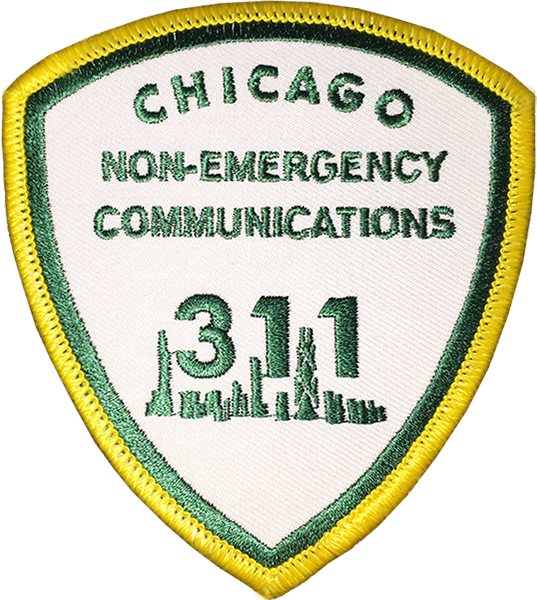 Description: Worn by uniformed members from the Office of Emergency Management & Communications (OEMC) working on the non-emergency (311) side of dispatch operations. Description: Worn by a uniformed Community Service Aide of the Chicago Police Department. The Community Service Aide was a civilian employee of the Department. They were hired as part of the Model Cities Program. The program was funded by the Housing and Urban Development (HUD). Over 50 governmental and private agencies participated in the program. 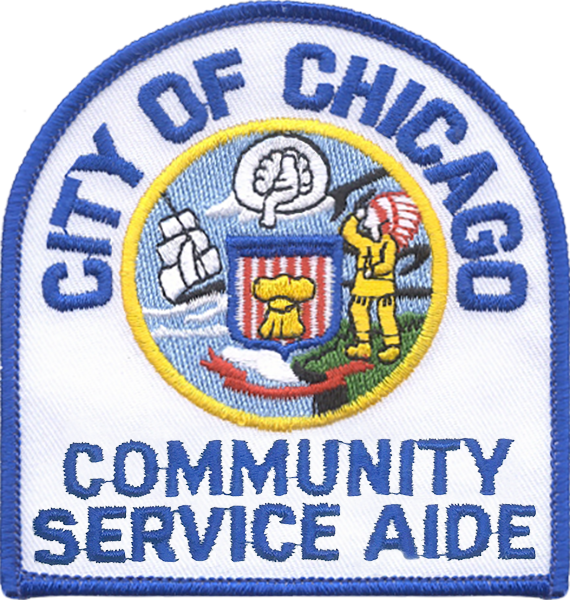 The Chicago Police Department’s contribution was the hiring of 344 Community Service Aides. Each aide was given 455 hours of classroom instruction on Criminal Law, Investigation, Management Development, Social Sciences and a variety of other subjects. They worked as teams with a police officer assigned as a team supervisor. The team consisted of one police officer and seven to twelve aides. Patrolling on foot, the aide assisted the police officer in alleviating dirty alleys by reporting sanitation violations, protecting school children by acting as crossing guards on secondary crossings and as reliefs for regular crossing guards. They also promoted the orderly flow of traffic at athletic events, supervising at parks, playgrounds and libraries, clearing streets of junk cars and by performing many other services. The aides starting pay was $445.00 per month with 5 step increases topping out at $540.00 per month or $6,480.00 per year after one full year of service. They were also allowed to attend 9 hours a week of formal educational courses with pay. The program was staffed by 5 Lieutenants, 18 Sergeants and 31 Police Officers and operated in the 2nd, 10th, 11th, 20th and 21st police districts. Dimensions: The Shoulder Patch will be rectangular in shape with the upper corners curved to create a single arch across the top and measure 3 1/2″ wide by 4″ high. The Designator Patch will be rectangular in shape and measure 2″ wide by 4″ high. 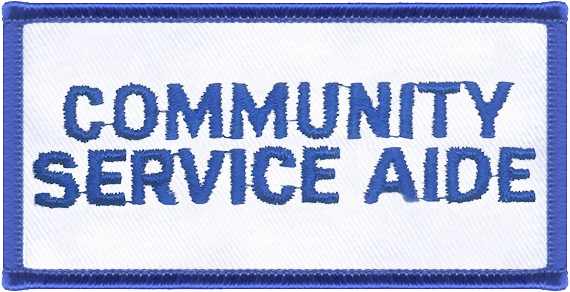 Lettering: The Shoulder Patch will have the letters of the words “COMMUNITY SERVICE AIDE” positioned in an upright position within the lower portion of the patch, centered, with the word “COMMUNITY” over the words “SERVICE AIDE.” All letters of both words are to be approximately 3/8″ in height and 1/4″ wide. A 1/8″ rolled merrowed border will be stitched on the outer edge of the patch. A 1/4″ overlap will complete the merrowed border and the loose ends of the stitching will be secured to the back side of the patch. The Designator Patch will have the letters of the words “COMMUNITY SERVICE AIDE” positioned in an upright position within the patch, centered, with the word “COMMUNITY” over the words “SERVICE AIDE.” All letters of both words are to be approximately 7/16″ in height and 5/16 of an inch wide. A 1/8″ rolled merrowed border will be stitched on the outer edge of the patch. A 1/4″ overlap will complete the merrowed border and the loose ends of the stitching will be secured to the back side of the patch. The Designator Patch will be sewn on all shirts in the location designated for a star. All patches will be sewn on with thread that closely resembles the outer border of the patch. 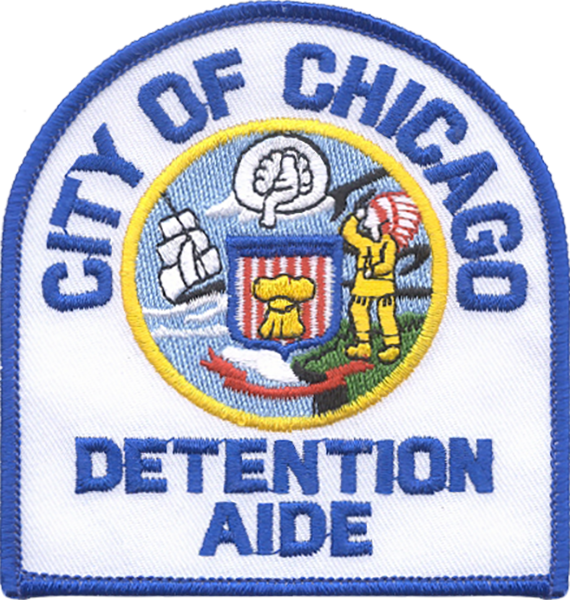 Description: Worn by a uniformed Detention Aide of the Chicago Police Department. The Detention Aide is a civilian employee. They assist sworn police officers working as Lockup Keepers with prisoner processing and movement in Department holding facilities. Lettering: The Shoulder Patch will have the letters of the words “DETENTION AIDE” positioned in an upright position within the lower portion of the patch, centered, with the word “DETENTION” over the word “AIDE.” All letters of both words are to be approximately 3/8″ in height and 1/4″ wide. A 1/8″ rolled merrowed border will be stitched on the outer edge of the patch. A 1/4″ overlap will complete the merrowed border and the loose ends of the stitching will be secured to the back side of the patch. 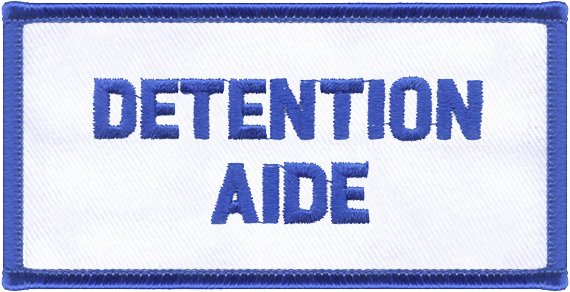 The Designator Patch will have the letters of the words “DETENTION AIDE” positioned in an upright position within the patch, centered, with the word “DETENTION” over the word “AIDE.” All letters of both words are to be approximately 7/16″ in height and 5/16″ wide. A 1/8″ rolled merrowed border will be stitched on the outer edge of the patch. A 1/4″ overlap will complete the merrowed border and the loose ends of the stitching will be secured to the back side of the patch. 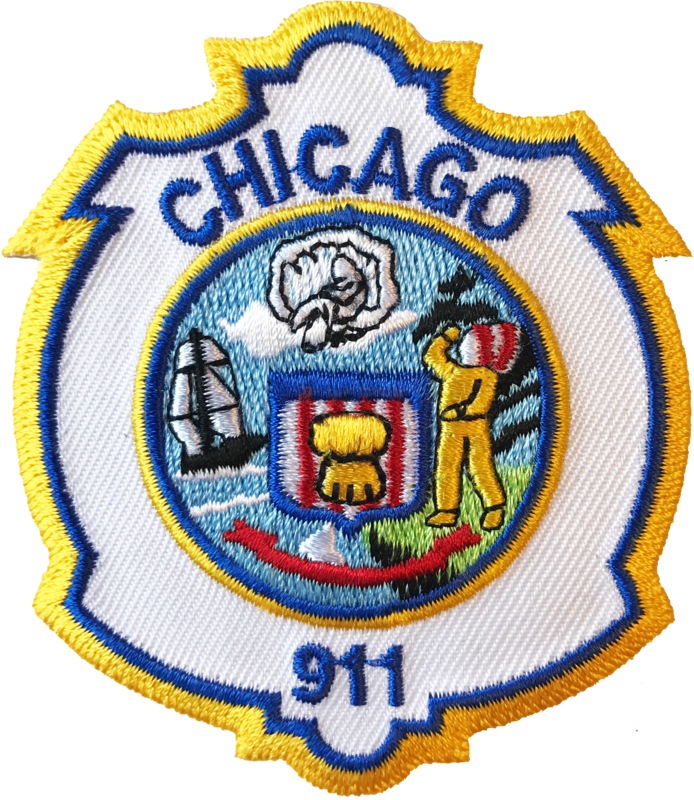 Description: Worn by a uniformed Dispatcher of the Chicago Police Department. The Dispatcher is a civilian employee of the Department. They assisted sworn police officers working in the Communication Operation Section at the old police headquarters located at 1121 South State Street. 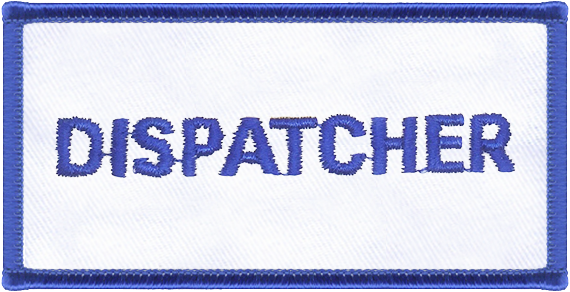 Lettering: The Shoulder Patch will have the letters of the word “DISPATCHER” positioned in an upright position within the lower portion of the patch, centered. All letters are to be approximately 3/8″ in height and of an 1/4″ wide. A 1/8″ rolled merrowed border will be stitched on the outer edge of the patch. A 1/4″ overlap will complete the merrowed border and the loose ends of the stitching will be secured to the back side of the patch. 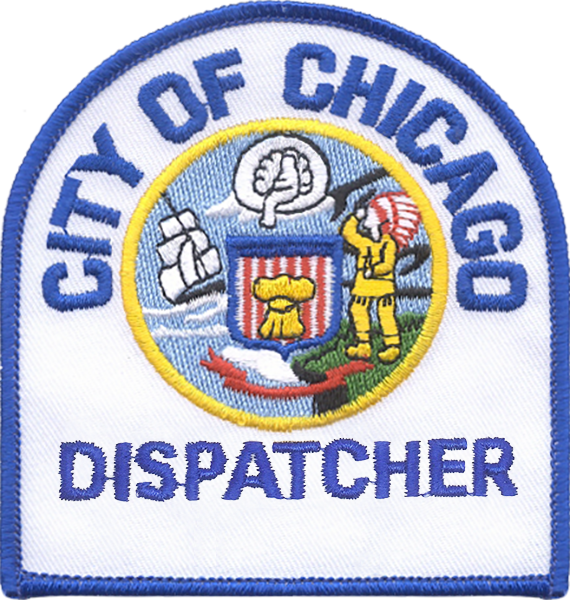 The Designator Patch will have the letters of the word “DISPATCHER” positioned in an upright position within the patch, centered. All letters of the word are to be approximately 7/16″ in height and 5/16″ wide. A 1/8″ rolled merrowed border will be stitched on the outer edge of the patch. A 1/4″ overlap will complete the merrowed border and the loose ends of the stitching will be secured to the back side of the patch. Description: Worn by a uniformed Dispatcher Aides of the Chicago Police Department. The Dispatcher Aide is a civilian employee of the Department. They assisted sworn police officers and civilian dispatchers working in the Communication Operation Section at the old police headquarters located at 1121 South State Street. 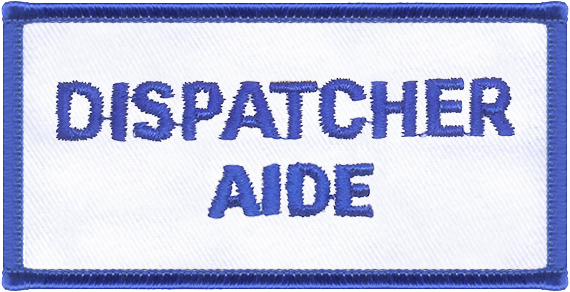 Lettering: The Shoulder Patch will have the letters of the words “DISPATCHER AIDE” positioned in an upright position within the lower portion of the patch, centered, with the word “DISPATCHER” over the words “AIDE.” All letters are to be approximately 3/8″ in height and of an 1/4″ wide. A 1/8″ rolled merrowed border will be stitched on the outer edge of the patch. A 1/4″ overlap will complete the merrowed border and the loose ends of the stitching will be secured to the back side of the patch. 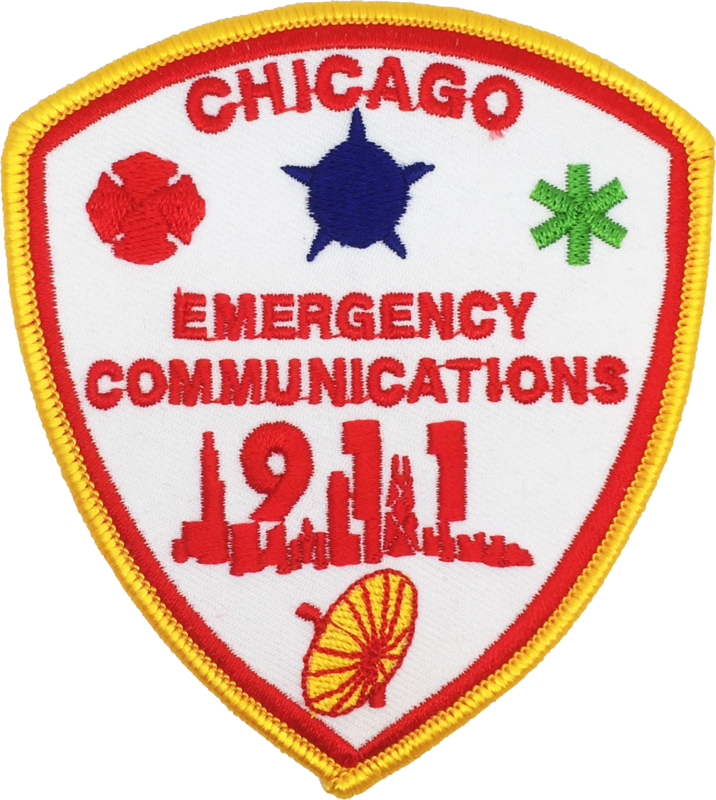 The Designator Patch will have the letters of the words “DISPATCHER AIDE” positioned in an upright position within the patch, centered, with the word “DISPATCHER” over the words “AIDE.” All letters of both words are to be approximately 7/16″ in height and 5/16″ wide. A 1/8″ rolled merrowed border will be stitched on the outer edge of the patch. A 1/4″ overlap will complete the merrowed border and the loose ends of the stitching will be secured to the back side of the patch. 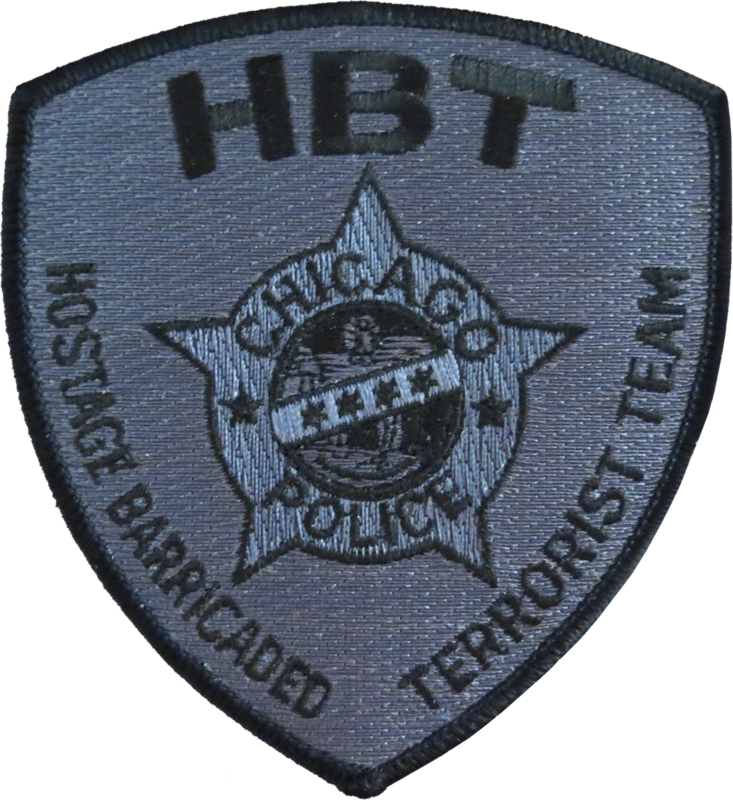 Description: Worn by uniformed members from the Hostage Barricaded and Terrorist Team (HBT). This patch was worn on the BDU class uniform. Dimensions: The patch will be teardrop in shape and measure 3″ wide by 4 1/2″ high with a thickness of 1/16″. 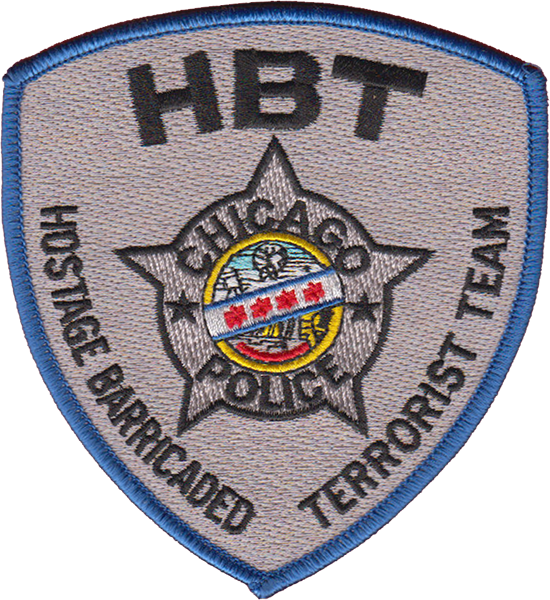 Lettering: The Shoulder Patch will have the letters of the word “HBT” positioned in an upright position over the center seal within the Upper portion of the patch, centered. The words “HOSTAGE BARRICADED TERRORIST TEAM” will be positioned in an upright position under the center seal, centered. All letters are to be approximately 9/16″ in height and 1/8″ wide, the letters in the word “HBT” will be approximately 3/4″ in height and 1/4″ wide. A 1/8″ rolled merrowed border will be stitched on the outer edge of the patch. A 1/4″ overlap will complete the merrowed border and the loose ends of the stitching will be secured to the back side of the patch. 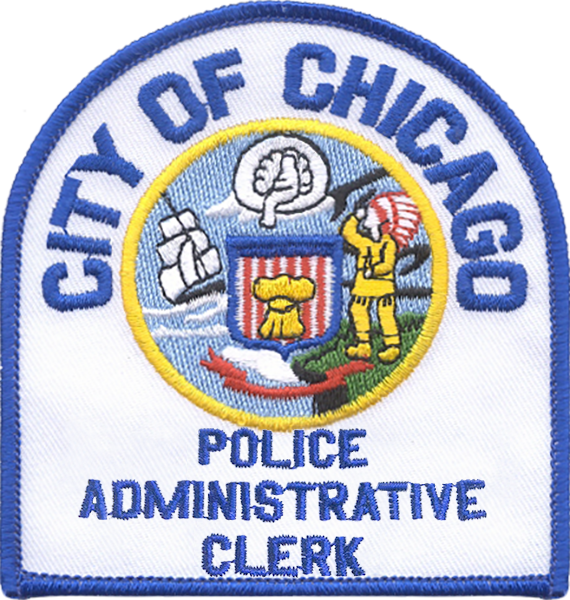 Description: Worn by a uniformed Police Administrative Clerks of the Chicago Police Department. The Police Administrative Clerk is a civilian employee of the Department. They assist sworn police officers working at district desks or in administrative capacities doing clerical work. 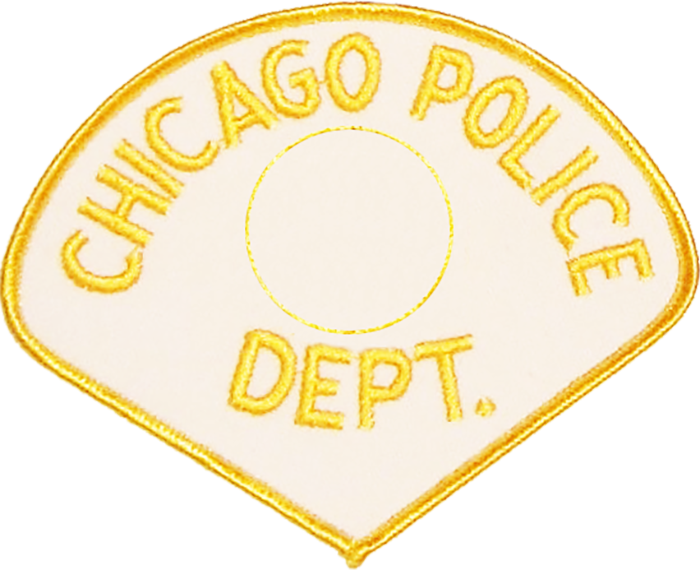 Lettering: The Shoulder Patch will have the letters of the words “POLICE ADMINISTRATIVE CLERK” positioned in an upright position. Centered will be the word “ADMINISTRATIVE.” “POLICE” will be over and “CLERK” will be under. All letters are to be approximately 3/8″ in height and of an 1/4″ wide. A 1/8″ rolled merrowed border will be stitched on the outer edge of the patch. A 1/4″ overlap will complete the merrowed border and the loose ends of the stitching will be secured to the back side of the patch. 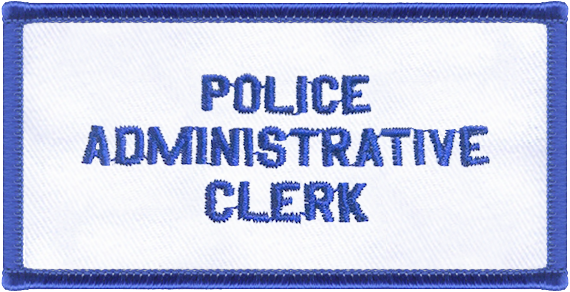 The Designator Patch will have the letters of the words “POLICE ADMINISTRATIVE CLERK” positioned in an upright position. Centered will be the word “ADMINISTRATIVE.” “POLICE” will be over and “CLERK” will be under. All letters of the words are to be approximately 3/8″ in height and 5/16″ wide. A 1/8″ rolled merrowed border will be stitched on the outer edge of the patch. A 1/4″ overlap will complete the merrowed border and the loose ends of the stitching will be secured to the back side of the patch. Lettering: The Shoulder Patch will have the letters of the words “POLICE AIDE” positioned in an upright position within the lower portion of the patch, centered, with the word “POLICE” over the word “AIDE.” All letters are to be approximately 3/8″ in height and of an 1/4″ wide. A 1/8″ rolled merrowed border will be stitched on the outer edge of the patch. A 1/4″ overlap will complete the merrowed border and the loose ends of the stitching will be secured to the back side of the patch. 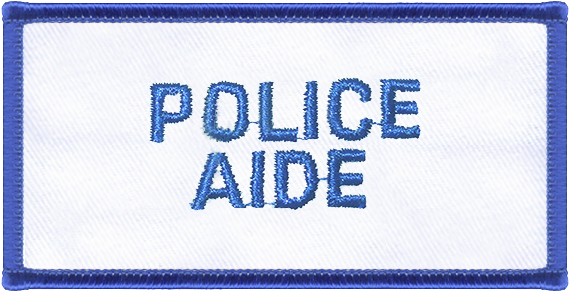 The Designator Patch will have the letters of the words “POLICE AIDE” positioned in an upright position within the patch, centered, with the word “POLICE” over the word “AIDE.” All letters of both words are to be approximately 7/16″ in height and 5/16″ wide. A 1/8″ rolled merrowed border will be stitched on the outer edge of the patch. A 1/4″ overlap will complete the merrowed border and the loose ends of the stitching will be secured to the back side of the patch. Description: Worn by uniformed Officers of all ranks, the star measures approximately 3 1/2″ in height and 3 5/8″ in width. The patch is to be worn on the left breast as an alternative to wearing the metal star. The star will have the Officer’s star number embroidered at the center just below the city seal excluding Exempt ranks. Exempt ranks will have their rank title embroidered in place of the star number. This patch is onlyauthorized to be worn on outer garments, such as the vest, sweater, coat, and/or jacket exluding formal Class A dress. Material: Fully embroidered, the backing material shall be 7-8 ounces / yard, 65% polyester / 35% cotton twill. The thread will be colorfast super-strength rayon yarn vat-dyed in corresponding colors of the appropriate patch in Pantone® colors or equal and applicable standards. Thread colors are Black #5596C, Blue #2925C, Gold #109C, Grey #650C, Kelly #362C, Light Blue #277C, Red #186C, Royal #661C, Silver PMS 877 and White – Basic. 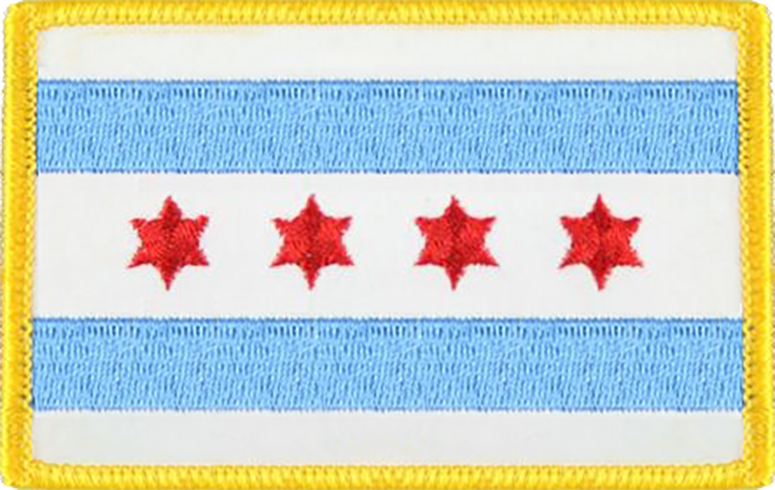 Dimensions: The patch will be a 5 point star in shape and measure 3 1/2″ wide by 3 1/2″ high with a thickness of 1/16″. Lettering: The lettering will be in block font measuring 1/4″ in height and 1/8″ wide. Placement: The Patch will be placed on the wearer’s left breast in the normal position of the metal police star. Description: Worn by uniformed members from the Special Weapons and Tactics Team (SWAT). This patch is worn on the BDU class uniform. 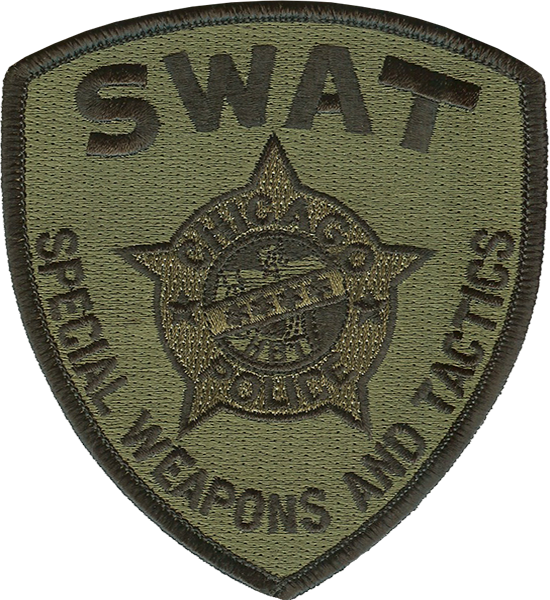 Lettering: The Shoulder Patch will have the letters of the word “SWAT” positioned in an upright position over the center seal within the Upper portion of the patch, centered. The words “SPECIAL WEAPONS AND TATCTICS” will be positioned in an upright position under the center seal, centered. All letters are to be approximately 9/16″ in height and 1/8″ wide, the letters in the word “SWAT” will be approximately 3/4″ in height and 1/4″ wide. A 1/8″ rolled merrowed border will be stitched on the outer edge of the patch. A 1/4″ overlap will complete the merrowed border and the loose ends of the stitching will be secured to the back side of the patch. Description: Worn by uniformed members from the Targeted Response Unit (TRU). These patches were worn on the corresponding BDU class uniform. 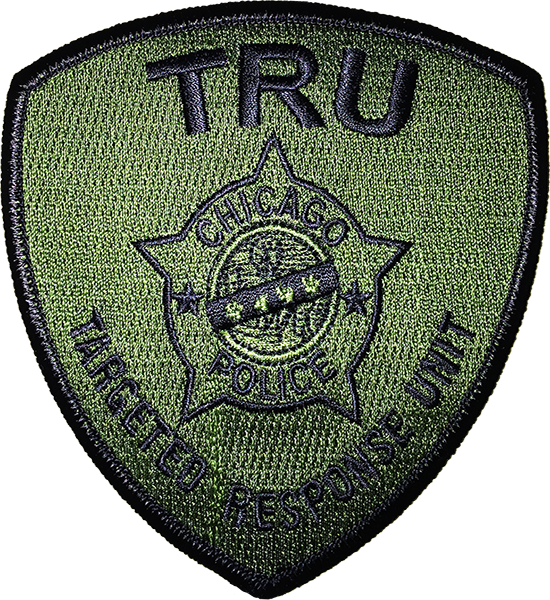 Lettering: The Shoulder Patch will have the letters of the word “TRU” positioned in an upright position over the center seal within the Upper portion of the patch, centered. 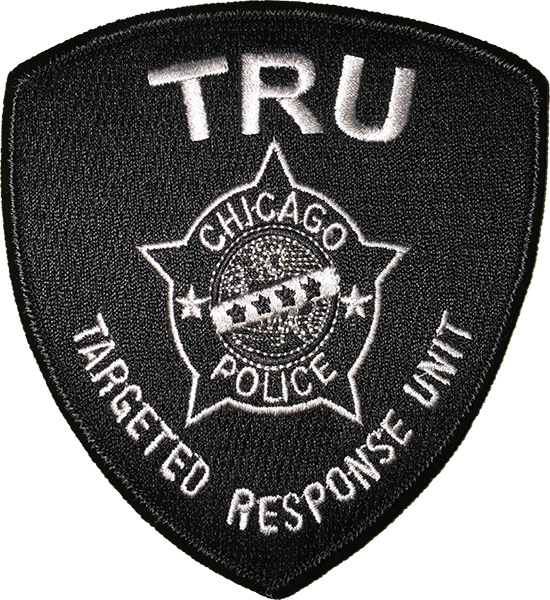 The words “TARGETED RESPONSE UNIT” will be positioned in an upright position under the center seal, centered. All letters are to be approximately 9/16″ in height and 1/8″ wide, the letters in the word “SWAT” will be approximately 3/4″ in height and 1/4″ wide. A 1/8″ rolled merrowed border will be stitched on the outer edge of the patch. A 1/4″ overlap will complete the merrowed border and the loose ends of the stitching will be secured to the back side of the patch. Description: Worn by a uniformed Traffic Aides of the Chicago Police Department. The Traffic Aide is a civilian employee of the Department. They assisted in directing and controlling traffic in the Loop and at special events. 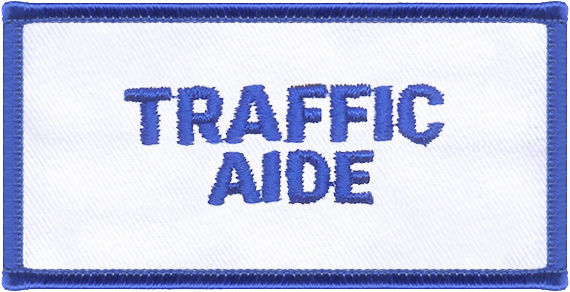 Lettering: The Shoulder Patch will have the letters of the words “TRAFFIC AIDE” positioned in an upright position within the lower portion of the patch, centered, with the word “TRAFFIC” over the word “AIDE.” All letters of both words are to be approximately 3/8″ in height and 1/4″ wide. A 1/8″ rolled merrowed border will be stitched on the outer edge of the patch. A 1/4″ overlap will complete the merrowed border and the loose ends of the stitching will be secured to the back side of the patch. The Designator Patch will have the letters of the words “TRAFFIC AIDE” positioned in an upright position within the patch, centered, with the word “TRAFFIC” over the word “AIDE.” All letters of both words are to be approximately 7/16″ in height and 5/16″ wide. A 1/8″ rolled merrowed border will be stitched on the outer edge of the patch. A 1/4″ overlap will complete the merrowed border and the loose ends of the stitching will be secured to the back side of the patch.